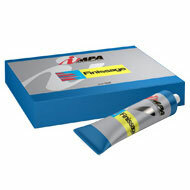 Impa 1K Grey Stopper Finissage (Spat O Rapid) is a knifing nitroacrylic putty in tube. One component fine filler. Spot putty used on nitrocombi and thermoplastic old films.Suitable for restoration of cars and motorcycles. Used also on large surfaces by thin layers. Good filling power, shrinkage free, easy to apply, easy to sand with no puttying marks when the top coat is over applied. Comes supplied in a 180g tube.